Fashion has always predicted style and consumer choice, but with choice becomes the responsibility and there has recently been a shift to making the safest, easy to clean and economical seat for children’s needs, which is great, however, the earlier days this seemed less about practicality and safety and more about status and grandeur. Some exceptions are those families that could make and design their own chair, by either having a carpenter or woodworker in the close vicinity and this photo is a piece designed by an American Johnathan Jacobs in the 17th century. The design in this photo is Windsor and an old-fashioned approach, it has been beautifully shaped and carved, ensuring beauty and practicality remained. The Chair on the left of the photo has been shown to be used with a strap, which would have been used to make sure the child remained safe and unlikely to fall out, which is always a mother’s concern regardless of the year. There has been some debate about what age roughly the baby would have been sat in the high chair, but most guessing is in line with the infant being 6-9 months because our anatomy hasn’t changed that much in recent millennium. 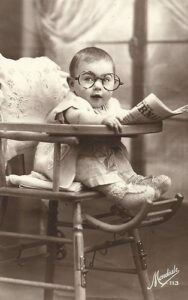 Some vintage toddler high chairs have the same foot rest as the modern ones seen today and there is a continuation that seems to be concurrent throughout its history. The history showed there was a change in design to accommodate rocking style chairs, which would have been fantastic for children, some even had wheels in which to move around in. The material these days is anything from metal, plastic or wood, but early beginnings were mainly wood and him main differences were in which type of wood was used, which came down to geographical location and availability. This child looks rather adorable and especially in this vintage piece, which seems to highlight just how far the modern designs have come. This chair looks really uncomfortable and the padding seems minimal, to say the least. All beginnings morph into some new form or another and although the modern high chair has developed into a complex multi-purpose tool for assisting the parent through all stages of development, it has remained constant in the fact that they are helping mothers all over the world. 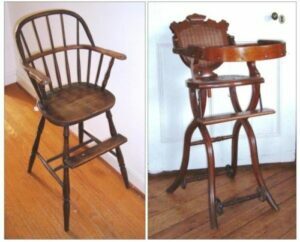 Below are some modern photos of the vintage high chair style, try to see if you can see any differences for the past to the present..